BOGOTA, Colombia -- Colombia's police could start using drones to tackle a five-year surge in cocaine production that has jeopardized relations with the United States. State contracting documents show that anti-narcotics police in the South American country have hired a local company to test drones for spraying herbicides on fields of coca, the base material for cocaine. The remote-controlled devices will be expected to eradicate 20 acres of coca per day, while carrying approximately 2 gallons of herbicide on every flight. Coca cultivation has doubled in Colombia since 2012, and currently exceeds 188,000 hectares, according to U.S. estimates. Three years ago Colombia decided to ban the aerial spraying of coca crops over environmental and health concerns. But drones fly at lower altitudes than spray planes and are expected to have a smaller environmental impact. The drones could also help Colombian police get around some of the challenges that come with eradicating coca fields in remote and often hostile areas of the country, where the fields are sometimes defended by heavily armed drug trafficking groups or seeded with land mines. "This decision addresses some of the concerns raised by aerial spraying," said Juan Carlos Garzon, a drug policy specialist at Colombia's Ideas for Peace Foundation. "But drones also have their limitations." 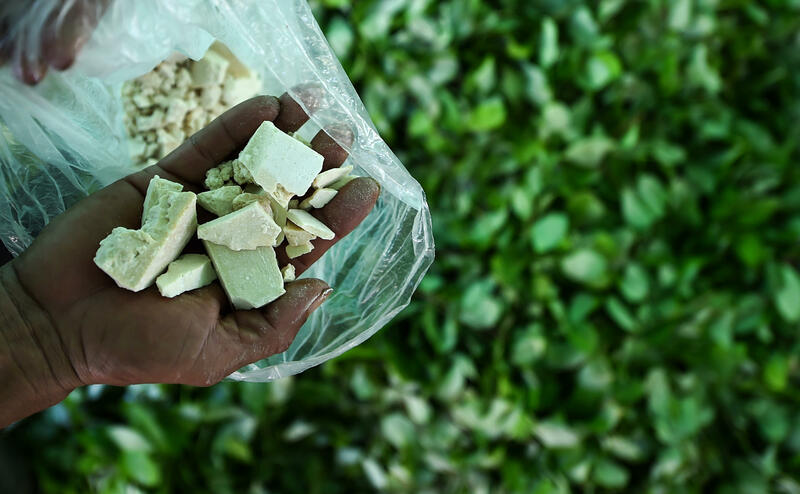 Colombia's decision to stop aerial eradication of coca crops has been harshly criticized by U.S. officials who have pushed the country to reduce cocaine production. A DEA report in 2017 estimated 93 percent of cocaine seized in the U.S. came from Colombia, whose potential cocaine production tripled from 2013 to 2016, according to the agency. Colombian officials have argued, however, that aerial spraying destroys legal crops near coca fields and pollutes local water sources. A World Health Organization study said that glyphosate, the chemical used in spraying campaigns, could be a carcinogen, leading Colombia to cancel aerial fumigation. Colombia is testing other devices as it tries to crack down on cocaine production, including small, armored vehicles known as "caterpillars" that protect manual eradicators from land mines.